Gold Stacking Gem Set Rings. Sold individually. 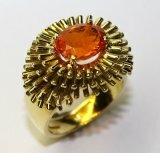 One of Britain's leading bespoke jewellery craftsmen and designers,. All Bruce's jewellery is handmade in his workshop on the Roseland and sold in Europe, Japan, America and the U.K.
We particularly like Bruce's work because of his striking combinations of beautifully coloured stones and his unique imaginative designs. In his jewellery you will find waves, feathers, rainfall and magnificent gold anemones alongside ferns, vines, scallops, and ammonites. The unique items show wonderful skill and craftsmanship in the intricate detailing of the metalwork and the fine finish; the result of many years of experience, practice and learning.